Extremely comfortable and stylish. I've had a lot of compliments at work. I love wearing these. Definitely have to buy another pair. Comfortable, stylish, and light. The leather is very soft and scuffs easily but don’t let that stop you. Some mink oil and looks good as new. Phenomenal shoe! Comfortable, clean and well built. Excellent shoe! 10.5 fits me great (true to size) and is super comfy. Sharp look as well, not too causal for the office and not too formal for casual gatherings! Best of both worlds in this one. These shoes are a big problem, I cannot wear them without people asking me about them or complimenting them all the time. The sole is very soft and it softens even more overtime, it feels you’re wearing Nikes. I dislike when shoes get all wrinkled from wear, this particular shoe stands in great construction and it still looks amazing. I do have to say, it took me a week to get my feet used to them and not feel the back of the shoe hurting me, but really that happens with all good leather pair of shoes. Awesome shoes. One of the best pair of shoes I have purchased in a long time (and I've purchased a few!). So far so good. They look great, feel great and fit great. Great shoe . This is my 3rd purchase . Have had both hips and knee replaced . These shoes have great look and super comfortable !! Extremely comfortable shoe. However, the regular size is fairly wide. By far the best pair of shoes I have ever purchased! very pleased with the shoe and the comfortability that is has . Great shoes. Ordered first pair last week and already ordered a second pair. Most comfortable work shoe I’ve worn and can either where them casual with jeans or dress them up with a suit. Would recommend if you are on your feet all day. Very very very very comfortable shoes! 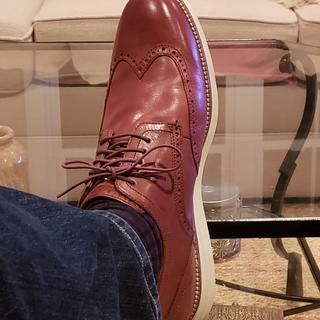 My first pair of Cole Haan's great looking shoes, they feel like gloves in my feet, I really like your brand of shoes and I will continue using them. I usually love these shoes but this pair digs into my heel and ankle. Not sure if it’s a defective pair or what because I’ve never had that problem before. They’re unwearable :-(. Another great pair of shoes! Another very versatile shoe that is both comfortable and stylish. I have received compliments every time I have worn these shoes. Ordered these shoes for my son to wear with his suit to a wedding and reception. He received numerous compliments on the shoes. He also stated that the shoes were very comfortable and lightweight. Confortable casual shoes, well made and soft, nice designed. love theses shoes. very comfortable and stylish..
Love the shoes! I’d def buy another pair and have received numerous compliments. Super comfortable and fun to wear. I got these in 10.5 wide (I usually wear 11 or 11.5) so order a half a size down, particularly if you are ordering EEE. These shoes have minimal arch support, so you may want to swap the insole for arch supports. Overall, these shoes are stylish and super comfortable. I might get another pair in a different color. Love the look & design, cant find a variety of wide shoes with good designs, comfort & looks. The stylish look and comfort of Cole Haan shoes are unbeatable. I get so many compliments when I wear my other Cole Haan shoes. Top-shelf for sure. Classic style and good price! Classic brown wingtip, you can dress up and casual. This is the way to go! I picked this shoe because I liked the design as it is modern and I tried the shoe on in store and liked how comfortable it was. The stores did not have my size so I bought direct from Cole Haan. I saw someone else wearing these and thought they looked cool and comfy. This is my second pair of these shoes. They look nice at work, are very versatile, and are still comfortable after a long day. Highly recommended among my fellow colleagues. Both stylish and very comfortable shoes. I was in one of your stores and this shoe caught my eye but they didn't have my size. This is my second pair of the ØriginalGrand Wingtip Oxford. I love it. I own two pairs already. By far the finest dress shoe ever. Style! Love the ivory sole! Want a cross of comfort in dress shoes, versatility style. I believe it will be a great comfortable work shoe being on me feet 8-9 hours a day! Because it will be look very good to my nephew and its my Birthday Gift for him!! I like Cole Hann very much especially for my son!! I CHOOSE THIS ITEM FOR A CHRISTMAS PRESENT FOR MY SON. WE HAVE BOUGHT COLE HANS SHOES BEFORE SO I KNOW HE WILL BE VERY EXCITED AND HAPPY WITH HIS GIFT. Asked a friend what kind of shoes he wears as he is on his feet all day working for a casino and said he wouldn't buy another brand of dress shoes. Classic Style. Can wear with jeans/chinos/slacks. Style, color combination, quality of leather upper. I was told these are a good option when attending trade shows. Really liked the look of these shoes. I talked to a few coworkers who have them and they all recommended. Seeing the CH staff response to another question, ‘the Woodbury color varies’, which more-accurately describes the color—light brown or ox blood (maroon or burgundy)? BEST ANSWER: To answer more correctly, our exclusive Woodbury color - much like British Tan - can look different when applied to different leathers. Smooth, soft nappa leather will not be the exact same shade of Woodbury as a stiffer, shiny leather used on a Pinch Loafer. It will look different on a glove than an shoe - all depends upon what leather it is applied to. Woodbury is neither light brown nor maroon/burgundy - which have strong red tones. It is best described as a warm, rich medium brown. After about 6 months of wear, the rubber piece on heel-side of the sole is coming off. What's your repair policy on this? BEST ANSWER: We do not have a repair service, however, this is an easy fix. We recommend bringing to shoe to a shoe repair shop to see if they can re-adhere that piece to the heel area of the sole. What polish color should be used for the Woodbury color show? BEST ANSWER: Woodbury shades can vary and if the color is too dark it will change the look of the shoe. We recommend using our neutral shoe cream. I had it shined and they used a darker brown cream and now I does not look so god - it has lost its shine and great color. But shouldn't there be a shoe cream that matches this color? Clear will protect it, but will not restore the color, correct?. Are these shoes to casual to wear with a suit? BEST ANSWER: I would pair them up with a suit jacket and no tie. Too casual for suit and tie. My husband is an accountant and wears them to work with jeans. I would say yes...unless it’s a casual suit. Soft bottom shoes tends to be more laid back...casual appearance. I wear them regularly to Court in suit and tie. But Phoenix can be pretty causal. They are as versatile as you can imagine. A suit is very much acceptable too. Depends on your style, but probably yes. They are pretty casual. Can I wear it under jeans? BEST ANSWER: Yes, but they feel a little too dressy for jeans and a little too casual for business slacks/dress pants. However, they work very well with khakis. Absolutely. I wear these to my office with jeans and get compliments often. Should I use shoe trees in my OriginalGrand Wingtip Oxford? BEST ANSWER: I do because every pair of shoes that I put a tree in keeps a great appearance for a longer period of time than it otherwise would. It isn't relevant that the "sole is very flexible". The upper part of the shoe is what you want to retain its shape, the best way to do this is with a shoe tree. I don’t as I have found that the shoes hold pretty well. Hi, how big (in centimeters ) is number 8.5? what belt color should I buy to match these? BEST ANSWER: I’d say it’s a case of the drapes matching the carpet-look for a similar color. Or a fabric or woven belt in beige or olive would be nice. Whatever color shoe you buy, the belt MUST match the color of the shoe. Will an orthotic fit in this shoe? Is the insole 100 percent leather? BEST ANSWER: No, the insole is an exclusive design, a combination of synthetic materials. Where can I purchase matching replacement shoe laces? What's the length of the shoe laces? BEST ANSWER: Lace length is measured by # of eyelets and shoe size. For an oxford like this one with 6 pairs of eyelets, a medium sized shoe (8,9,10) would require a 45" lace. What's the weight for these shoes? BEST ANSWER: Weight will vary slightly by shoe size. For example, the Original Grand Wingtop in size 8 weighs approximately .70 pounds or 11.2 ounces for one shoe. I normally wear a us size 9, should i get a half size smaller? BEST ANSWER: Nope, it is very true to size. I am a size 9 and use size 9 for this particular one. What is difference in width between Medium & Wide ? Trying to figure out if I may need to stretch Medium, or get a Wide. BEST ANSWER: The standard difference in widths is approximately 1/4" in both men's and womens shoes. While the increased width applies to the entire foot bed, The difference is felt primarily in the forefoot and the heel. We recommend a visit to a good shoe retailer or shoe department to have your foot measured on a Brannock device. This will tell you what your true shoe size is. Then check out the Reviews tab for more fit information. Also, use the TrueFit widget on the product page for best fit advice. Hi, how big (in centimeters) is number 13? What is used to waterproof this shoe? BEST ANSWER: This leather oxford is not waterproof and should not come into contact with wet conditions. We do not recommend applying any waterproofing agents or substances. To see Cole Haan styles that are waterproof, enter that term into the search box on any webpage at www.colehaan.com.